A traditional housewarming or business opening gift in Asian cultures, Money Plant is a whimsical looking tree with a broad thick trunk and very slender branches sporting glossy leaves. Often multiple trunks are braided together increasing the thick to thin effect. Do not overwater and a money tree can prosper for many years. 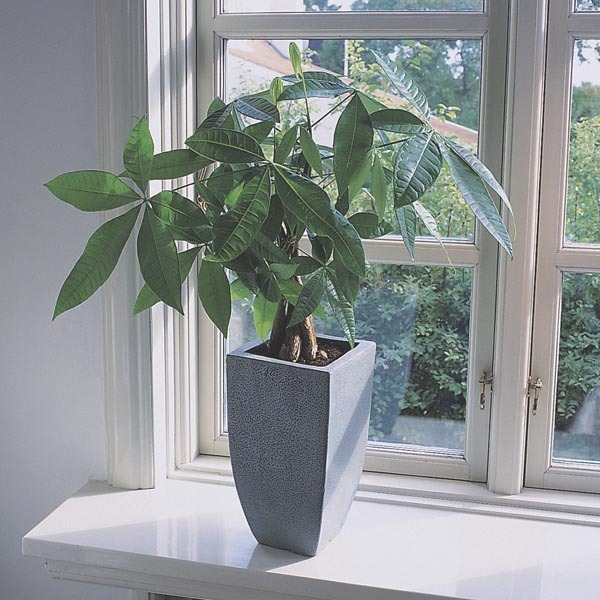 Small plants are very decorative in a windowsill or on a tabletop. Tall specimens make a great accent plant in bright locations indoors. Adds a fun, tropical feel to decks, patios or porches in warm weather. Monthly with mild liquid fertilizer during spring and summer. Water every 5 to 7 days depending on light and temperature. Prefers humid environments and well drained soil. Will tolerate slightly dry soil, so take care not to overwater.